Some people have a special gift. They’re able to travel between the realms of the Living and the Dead…and Tomb Raiding can mean Big Business. Welcome to the world of the Mojin. 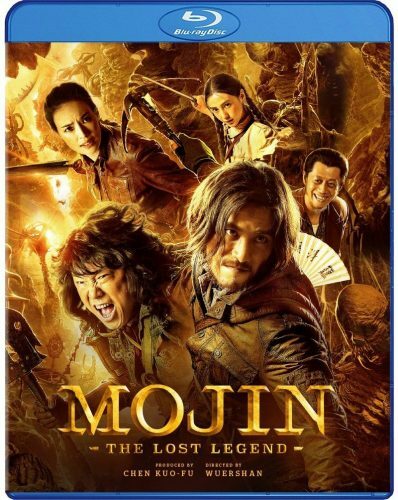 Based on the #1 Bestselling series of novels and starring Shu Qi, Chen Kun, Angelababy, and Huang Bo, MOJIN: THE LOST LEGEND pits a trio of legendary grave robbers against scholars, rivals, and the law until an offer from a mysterious stranger tempts them into one last heist…an adventure that will test their skills, their friendship, and ultimately their mortal souls. The Picture Quality is Top Notch and just a bit under great looking Animated films. Sharp Detail, great lighting and popping colors. Mojin The Lost Legend is an Action adventure mixed with some comedy. The film is basically treasure hunters or relic hunters who get a job to find a relic they seen before but located in a very dangerous place protected by mystical elements and Japanese Zombies. Well Go brings us a great looking Blu-Ray with good sound but as always I wash Asian films would bring us more realistic CGI. The Story is good but of course its a story seen before mixed with some new refreshing stuff. I Liked the whole 80’s or 90’s vibe when are lead males were in the US with the twin towers towering in the Back and Huge brick cell phones. One portion reminded me of The Last Dragon with a few Asian guys break dancing in the ally way. Acting seems pretty good and action wise the film is fun-filled with combat and explosions. We also get some strategy and puzzle solving but I wished we had more of it. Overall Mojin The Lost Legend was a fun watch they my miss some viewers. We needed more mystery, puzzle solving portions to bring the adventure plot more up front. Also What is needed is more flashbacks like how are cast got into raiding tombs. Yes the film runs 2 hours but I think we can cut and more in its place to make it better. The ending may miss some viewers but I enjoyed the monsters and weird artsy look we had going on as its part of what that meteorite does. I Don’t want to spoil it on what it does but it makes scenes. With that said I give the film a 4 out of 5 for its fun, comedy and adventure style. Mixed with great looking PQ but some CGI could use a bit of work like when part of the mountain is collapsing. I say give the film a shot and pick it up.